Statically staged and dramatically clumsy but nonetheless quite interesting, particularly in light of recent events, The Court-Martial of Billy Mitchell (1955) is a quasi-biopic of Army Brig. General Billy Mitchell, who commanded American air combat units in France during World War I and today is considered the father of the U.S. Air Force. However, in the years following the Great War, Mitchell was a controversial, combative figure eventually put on trial as a whistleblower. Otto Preminger directed the all-over-the-map cast which, for instance, pairs as the prosecuting attorneys broad character comedian Fred Clark with indulgent Method actor Rod Steiger. Gary Cooper stars as Mitchell but he's badly miscast. According to the Internet Movie Database (IMDb), Mitchell's family was hoping James Cagney, an actor capable of expressing the historical Mitchell's violent temper effectively, would portray him. Instead, Coop's stubborn but placid approach ultimately comes off as ineffectual instead of heroic. The Court-Martial of Billy Mitchell is one of a dozen films produced by Milton Sperling and his United States Pictures through Warner Bros. (Sperling was Harry Warner's son-in-law), which helped finance their production. Warner Bros. no longer owns these dozen or so films. Instead, they are presently controlled by Paramount through Viacom, who in turn have licensed this and other United States Pictures titles to Olive Films. This may account for the fine video transfer of notably damaged film elements. A WarnerColor (i.e., brown) and CinemaScope production, the image is rife with negative scratches, speckling, blotches, and other myriad imperfections, compounded by several appallingly bad optically-printed close-ups and sound drop-outs presumably already part of the film when it was new. Nevertheless, this almost certainly is the best the film has ever looked on home video and I'm glad Olive chose to release it. In the years following World War I, war hero Brig. General Billy Mitchell (Gary Cooper) tirelessly urges the Army to establish a new branch of the Armed Forces, convinced the future of warfare lay in aircraft capable of devastating aerial bombings and of facilitating massive troop invasions. Not only are these pleas continually rejected, Mitchell's existing flying force (whose pilots include Peter Graves and Darren McGavin) are limited to a tiny handful of antiquated planes left over from the last war, planes subject to so many mechanical failures they're veritable death traps. The pilots don't even wear parachutes. Mitchell tries to prove the potential of an air attack at a public demonstration where his pilots attempt to sink the "unsinkable" German warship Ostfriesland. But Mitchell's superior, Gen. Guthrie (Charles Bickford), does everything possible to ensure an unsuccessful attempt. 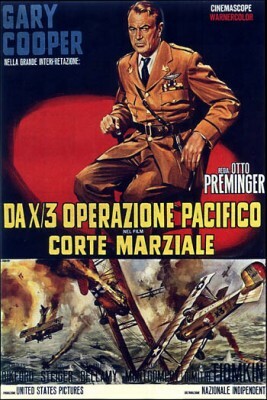 Mitchell does manage to spectacularly sink the German warship (played by an unconvincing model) but only by disobeying Gen. Guthrie's explicit orders about the flight path and size of the bombs. Mitchell is demoted to Colonel and transferred to Fort Sam Houston. The last straw comes when Mitchell's close friend, Naval commander Zach Lansdowne (Jack Lord, with Elizabeth Montgomery as his wife, each making their film debut), feels duty-bound to follow orders and take the Shennendoah, a dirigible, on a publicity tour of the Midwest knowing weather conditions all but guarantee disaster for him and his men. The dirigible does indeed crash and all hands are lost. Incensed, Mitchell calls an unauthorized press conference declaring, "incompetence, criminal negligence, and the almost treasonable administration of our national defense by the Navy and the War Department." A court-martial is ordered, and the second-half of the picture follows the claustrophobically photographed trial, the movie ending rather abruptly at its conclusion. The film was an early CinemaScope production, with a screen shape Preminger quickly learned to expertly stage scenes involving large groupings of actors. But, here, many shots are awkwardly composed, and at least twice Preminger resorts to incredibly grainy, optical printer-induced close-shots that look just plain wrong. The warehouse converted into a courtroom for Billy Mitchell's court-martial has a peculiar layout. Court spectators are delegated to a distant adjunct far from the action, and not once does Preminger cut away to a reaction shot of any of them. The set may be based on the historical space used for the real trial, but it's so cramped Preminger's cameras can't even get the judges against one wall and the defendant and prosecutors all in the same shot. Before all this, fortunately, is much good use of Washington D.C. locations. Other than the steps of the U.S. Capitol for one scene, the locations are interesting spaces, avoiding obvious choices, and these scenes are populated by period vehicles and extras adding to their verisimilitude. Further, all this is preceded by some good aerial sequences, but after the bombing of the Ostfriesland, planes aren't seen again until the fade-out. What is interesting about the film in retrospect is its depiction of a whistleblower whose revelations, while entirely accurate, seriously damage the credibility of the Armed Forces at home and abroad, making plain its inability to properly defend American shores, and its culpability in the senseless death of its loyal servicemen, all of which could be argued also provided aid and comfort to America's enemies. In 1955 such a whistleblower is declared a hero, the subject of a multi-million dollar biopic and portrayed by one of its biggest - and most politically conservative - stars, in a Cold War climate to boot. Yet, in 2013, whistleblowers like Bradley Manning and Edward Snowden, making public similarly damning yet truthful revelations heretofore officially denied, have, for the most part, been vilified. This is not to say all three cases and their circumstances are exactly alike but parallels between Edward Snowden and Bradley Manning to Billy Mitchell are many, and some of these are strikingly similar. Mitchell, unlike Snowden and Manning, was a war hero and the son of a wealthy Wisconsin U.S. Senator. Though eventually convicted, Mitchell was vindicated in the years following his death (in 1936) thanks to his long record of uncannily accurate predictions once scoffed at, from aircraft far exceeding the speed of sound to, especially, his belief, first published in 1924, that Japan would someday launch an aerial attacking on Pearl Harbor. As described in more detail above, The Court-Martial of Billy Mitchell is a good transfer of seriously damaged film elements, with scratches and speckling galore. The shortcomings of early CinemaScope lenses compound the problem, as does Preminger's direction (such as his aforementioned use of optical printing). But, for what it is, it's certainly a film-like viewing experience, and for cup-half-full viewers like myself, presented no great distractions, though its dog-eared appearance is unavoidable. I suspect this originally received some release in four-track magnetic stereo, but those sound elements appear lost and the mono audio, English only with no subtitle options, is also okay, too, I suppose. No Extra Features. A long way from great but still worthwhile and interesting, The Court-Martial of Billy Mitchell comes Recommended.